WHAT ARE CARBON NANOTUBES? 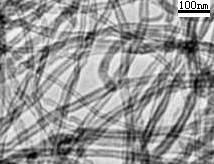 Carbon nanotubes are tubular forms of carbon that can be envisaged as graphitic sheets rolled into cylindrical form. 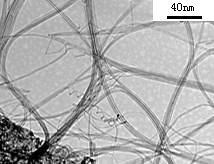 These nanotubes have diameters in the range of few nanometers and their lengths are up to several micrometers. Each nanotube is a single molecule made up of a hexagonal network of covalently bonded carbon atoms. Carbon nanotubes are of two types: single-walled and multi-walled. A single-walled carbon nanotube (SWNT) consists of a single grapheme cylinder, whereas a multi-walled carbon nanotube (MWNT) comprises several concentric grapheme cylinders. A schematic representation of a SWNT structure is shown in the figure below. Strong covalent bonding, unique one-dimensional structure and nanometer size, together impart unusual properties to the nanotubes. These properties include exceptionally high tensile strength, high resilience, electronic properties ranging from metallic to semi-conducting, the ability to sustain high current densities and high thermal conductivity. Thus carbon nanotubes could be used as fillers in super-strong composite materials, as wires and components in nano-electronic devices, as tips of scanning probe microscopes and in flat panel displays and gas sensors. Iijima reported the preparation of MWNTs by the arc-discharge of graphite electrodes in 1991. In 1993, Ijima and Ichihashi at NEC  and Bethune et al. at IBM  independently reported the preparation of SWNTs. Today, MWNTs are prepared in large quantities by the chemical vapor deposition process. SWNTs can be prepared in reasonably high yields by three techniques: arc-discharge of Ni-Y catalyzed graphite electrodes, laser ablation of Ni-Co catalyzed graphite targets and vapor phase paralysis of CO and Fe(CO)5 (HiPCO process). Carbon nanotube samples are always contaminated with impurities including amorphous carbon, residual metal catalyst and graphitic nanoparticles. Thus the purification and chemical processing of carbon nanotubes remains as a key step in any application.